HÀ NỘI — Agricultural, forestry and fishery exports in May hit an estimated value of US$2.8 billion, according to the Ministry of Agriculture and Rural Development. The value of the first five months of this year now equal $13.7 billion, up 9.5 per cent year-on-year, the ministry said. During the review period, farm produce export earnings have experienced a yearly rise of 12.6 per cent to an estimated $7.3 billion. After a long decline, rice exports increased both in volume and value. Up to 538,000 tonnes of rice, worth $245 million, were shipped abroad in May, raising the five-month volume to 1.3 million tonnes and value to $1 billion, up 1.6 per cent and 1.2 per cent year on year, respectively. China and Philippines were the two leading importers of Vietnamese rice. Despite a slight drop of 1.5 per cent in five-month quantity, rubber exports saw a significant rise of 61.5 per cent in value. 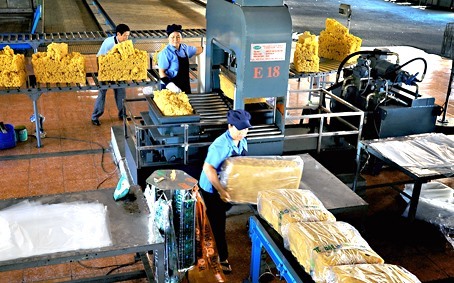 In the period, the country exported more than 350,000 tonnes of rubber, generating a turnover of $708 million. Similar to rubber, coffee exports also recorded a decrease of 15.9 per cent in volume, but an increase of 11 per cent in value in the January-May period to 693,000 tonnes and $1.57 billion. In May alone, some 100,000 tonnes of coffee were exported for $233 million. The five-month period also witnessed a strong growth in vegetable and fruit exports, which surged 38 per cent year on year to $1.38 billion, with $344 million earned in May. According to the ministry, the export value of seafood products surged 10.4 per cent to $2.8 billion from January to May, including $618 million in May. The US, Japan, China and South Korea were major import markets of Vietnamese seafood, accounting for 53.5 per cent of the sector’s total export value. Meanwhile, timber and timber product exports brought home $2.9 billion, 10 per cent higher than same period last year. Among markets which saw remarkable surges in the export value of Vietnamese wood and wooden products were China (35.6 per cent), the US (16.1 per cent), South Korea (14.7 per cent) and Germany (11.2 per cent).